It is no exaggeration to say that Russians were waiting for the first Tuesday after the first Monday in November 2012 with more interest than almost any other political events. On this day the United States was to choose the President, and for some reason most people were waiting for some wild intrigues of this process. However, there was no race neck to neck, as in the days of rivalry of George W. Bush and Albert Gore, when the struggle really was for every vote, and the election was almost routinely won by the President Barack Obama. Obama’s second term began on January 20, but it was clear long before this, that the US Administration was going to change dramatically. All the shuffling and the emergence of new faces in the Administration of the President of the United States, however, are unlikely to affect the policy of B. Obama’s Cabinet. Even during the first four-year term Barack Obama, compared with the 43rd president of the United States, was showing caution and restraint, though he recorded as the «big plus» the withdrawal of troops from Iraq and the overthrow of the Gaddafi regime. He really understands ineffectiveness of methods of direct force and the threat of international crises. Now Russia is far from the first position in the hierarchy of interests of the United States. The active «reset» of relations in the first years of B. Obama being the President has been replaced by Obama’s cool communication. It is hard to argue that Moscow is no longer a major direction for Washington’s foreign policy, in contrast to Beijing and problems in the Middle East. 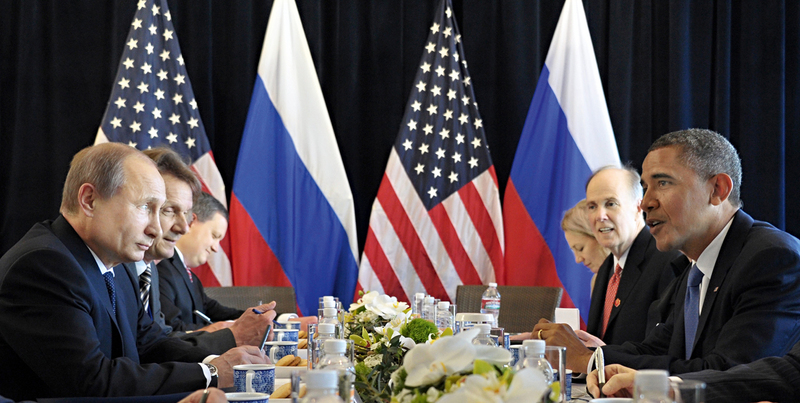 The USA are now ready to discuss with Russia only those issues, which Russia can help to solve. John Kerry does not conceal such a position of the Americans: «We have a fertile ground for the return of relations with Russia on the same level, the one where they were a year or two ago. We will be able to restore the relationship. The Russians are our partners, we are dependent on them, or rely on many issues: Syria, Iran sanctions, disarmament, START, DPRK, and WTO. And in many issues their position is extremely important to us». At the same time, if we take into account not only the political but also the economic component of the relationship, the US exporters are extremely interested in the Russian market in many sectors. We should not forget that most of the goods imported from the United States are high-tech products: vehicles, aircrafts, equipment, including these for the oil and gas industry, and machine-tools. Agricultural products are not far behind as well - the United States, for example, are the second largest exporter of meat to Russia. In general, the benefits are obvious, and in the future they promise only to grow. It is projected that by 2017 the United States will double the volume of exports to Russia from $ 11 billion to $ 22 billion. This process will probably be almost the primary one in the relations between Moscow and Washington at this time. We can say that similar situation exists in the relations of the United States and the most of Latin American countries. In general, Latin American countries are rapidly developing states, and at the same time, very promising markets for the United States. Exports to South and Central America are one of the key items in the foreign sales budget of Washington. But, as in the case of the Russian Federation, the political ties lag well behind of economic ones, albeit it is so for different reasons. The second term of Obama’s presidency will hardly bring any material changes. First, there are virtually no experts in Washington as a whole and at the State Department in particular, who would be really experienced in dealing with Latin America. Second, the same Congressmen will simply prevent Obama from any sudden actions. There is a real challenge before the new Administration of the 44th President of the United States to rebuild the Washington’s position in the Latin American region shattered in the past decades. In order to achieve this it is necessary to radically change the approach in cooperation with the countries of the southern continent. Just a few years ago, the US actions continued to be based here on the principles of the doctrine of Monroe, which have been established in the 19th century. It is strange that American politicians did not take into account how much Latin America has changed in the last couple of decades. In general, the B. Obama’s policy in respect of Latin America is quite ambiguous. Many accuse the US President that he is trying to divide the countries in the region to first-class passengers and all the rest, the place of which is in the rear. The former include the countries of the Pacific coast, such as Mexico, Peru, and Chile. In Washington they are considered as market ones, free, and worthy of partnership. It is these states that should enter, in particular, into a powerful new trade and economic organization, the idea of establishment of which is strongly supported by Barack Obama - Transpacific Partnership. And let the rest wallow in their own brew of populism and socialism, commodity economy and drug revenues. Indeed, the main problems in relations with Latin American countries are the fight against drug trafficking and regulation of migration. To date, the first time in US history, the number of illegal immigrants outnumber legal and is up to 20 million people, according to some experts. But this cake of problems is almost impossible to move. On the one hand, the tightening of migration laws will immediately have a negative impact on relations with the neighbours. On the other hand, it is impossible to legalize millions of immigrants from Latin America either - such an initiative will never go beyond the walls of Congress. Thus, Obama’s success on this issue depends on whether the efforts for economic development in Mexico, Central America and the Caribbean, will be applied to create jobs, provide higher education, law and order, and develop the infrastructure. The same approach may be applied in addressing the problems associated with illegal production and sale of drugs. However, the solution of long-standing problems with neighbouring countries is paling into insignificance. Now one of the foreign policy priorities is the Asia Pacific. Joe Biden, the US Vice President, stressed that the Trans-Pacific Partnership is crucial because «the economic engine of the world has shifted to the East», and it is in this region that we will experience the growth over the next 5 years. Partnership in Asia Pacific is the more important for the United States, as on the other side of the Pacific is the main competing partner of America - China. It is the partner because the two economies are intertwined too closely; and the competitor - because China, in the unanimous opinion of experts, will soon displace the United States from the place of the main superpower. In this regard, many agree that the conflict between Washington and Beijing is inevitable - China is growing by leaps and bounds, but the US is not used to just give up leadership to anyone else. The only question is in what form this process will proceed. One of the possible options is the gradual weakening of the friendly relations between China and Russia. The nationalists, who became the lead of the XVIII Congress of the CPC, do not already hold on to a strong friendship with the Soviet people and most of them have received a Western education, which invariably has its impact at thinking that Russia is a huge and accessible area. But the Middle East still remains perhaps the hottest area of the US foreign policy. All of the major forces are now there. This was confirmed by the visit of Barack Obama to the region. The time of presidency flies very fast, and in two or three years it will be much more difficult to achieve progress in resolving the Palestinian-Israeli conflict. It is necessary to enlist the support of Israel and Jordan on the situation in Syria as soon as possible. An important role in this process may belong to Turkey, friendship to which it tries to strengthen in every possible way, including the «carrot» of praise for the recent reconciliation with Israel. Of course, the United States does not forget that the main peacekeeper in that situation was Barack Obama. It seems that in the next few years the emphasis in Washington, at least, in foreign policy is unlikely to change. As before, the focus will be the Middle East diplomacy, increased interest will be shown in the Asia-Pacific region, competition with China will increase as well, some de-europeanisation probably with pulling the hand of friendship to address common challenges and threats at the same time. However, the President Barack Obama seems to be a masterful player who, reducing tension, lulls the vigilance of opponents and prepares the field for one, but a decisive step. So the second presidential term will show the power of Obama as a diplomat.